Dermal planing, also known as epi-blading, is a gentle yet highly effective way to exfoliate the skin of the face and neck, at the same time temporarily removing any soft vellus hairs (‘peach fuzz’). If you are looking for instant gratification this is the treatment for you - immediate results make it the ideal procedure before important functions. Dermal planing can be performed as a stand-alone service, but is fantastic when followed by a sonophoresis infusion or LED. The dermal planing is so effective at gently and comfortably removing the build-up of dead dry skin that it allows for better delivery of ingredients or penetration of the light. Dermal planing can be performed as a stand-alone service but is fantastic when followed by a sonophoresis infusion or LED. The dermal planing is so effective at gently and comfortably removing the build-up of dead dry skin that it allows for better delivery of ingredients or penetration of the light. Because there is no trauma to the skin, dermal planing is suited to all skin types including the most sensitive. Performed every 4- 6 weeks it makes for the perfect maintenance skin treatment. Instantly your skin will feel smoother than ever before- women's make-up goes on flawlessly and your complexion looks brighter and fresher. Dermal planing is also well suited to men however we cannot treat through facial hair areas (moustache and beard). Dermal planing is a comfortable method to exfoliate the surface skin of the face and neck, simultaneously removing the soft vellus hairs as well. This means instantly brighter and smoother skin. 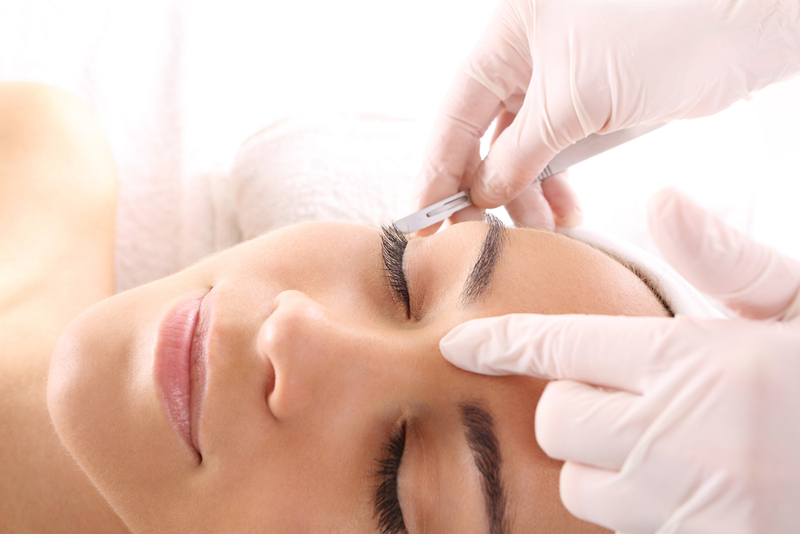 A small surgical blade held at a 45 degree angle etches away the desired skin and hair. Your skin is held taut to allow the blade to easily glide across the skin. The hairs will gradually grow back over a 6 week period with no change to the hairs, so they grow back exactly the same. After paperwork has been filled out treatments can be anywhere from 30- 60 minutes. Once every 4- 6 weeks is recommended for healthy looking skin. Dermal planing is especially effective on skins with a rough, dry texture, but it can be performed on anyone requiring exfoliation. Since there are no chemical peeling agents used, or abrasive micro tips, even the most sensitive skins benefit from dermal planing. It is also the only method of exfoliation that will not only exfoliate the skin, but also temporarily remove the fine blonde vellus hairs. Is it painful? Is there any downtime? There is no pain or downtime with this treatment. There can be a mild tingling sensation immediately after due to the exfoliation. This fades quickly.